WSD-F20A INDIGO BLUE The WSD-F20 Smart watch is the latest addition to the PRO TREK brand of outdoor watches by Casio that are designed for total appeal to outdoor enthusiasts. 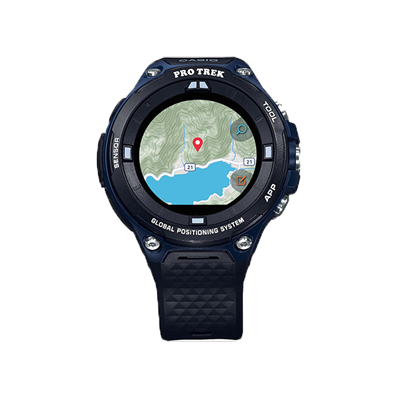 This limited edition variant is equipped with built in low-power GPS and colour map functionality, it supports a wide range of outdoor and water activities and can be used in areas without cellular service. Richly-designed and easy-to-read map data can be downloaded in advance and used with GPS data to track the user’s location and add markers, even when offline. Button guards, a protective bezel, and ergonomic side buttons enhance operability and toughness, solidifying the WSD-F20's status as the ultimate companion for the great outdoors. Wear OS by Google™ To connect the CASIO watch to a smartphone, the Wear OS by Google operating system must be installed on the device. Wear OS by Google offers a variety of pre-installed apps for outdoor activities. Additional compatible apps can be installed on the watch from the Google Play Store if desired. 4 GB internal memory Large memory offers sufficient space for additional apps. 512 MB RAM 512 MB of RAM available. Wi-Fi (IEEE 802.11 b/g/n) If Wi-Fi is enabled on your watch, it will automatically establish a connection to a known, available Wi-Fi network (if the watch is not connected to your smartphone via Bluetooth®). Bluetooth® Smart The watch is equipped with energy-saving Bluetooth® technology, which offers power-saving data transfer at the push of a button. The watch can connect to a smartphone wirelessly via Bluetooth®, enabling access to a wide range of useful functions. Super-Illuminator At the touch of a button, the display can be brightly illuminated in a fashionable colour MIL-STD-810G compliant The MIL-STD-810 is a U.S. military technical standard that specifies environmental test conditions for military equipment. The standard defines tests for the compatibility of equipment and devices with extreme temperatures and air pressures, solar radiation, humidity, chemicals, acceleration forces and vibrations. My Graph Feature Daily activity pattern: Stopped, walking, running, vehicle, calories burned, steps, altitude (highest achieved that day) and workout time., My Graph shows a graphic representation of your activities on the current day. It shows the type of activity you performed and when you performed it.